Make 4 payments of $719.25 over 8 weeks and get it now! The Rinnai C Series evaporative cooler comes with a whisper quiet direct drive fan maximising airflow and comfort to your home. 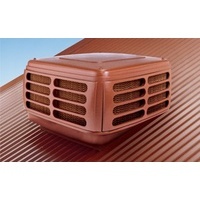 This high efficiency evaporative air conditioner is designed as a low profile unit to sit neatly and discreetly on your roof while providing excellent power, performance, efficiency and reliability. With it's leading edge water management system constantly monitoring your precious water this evaporative cooler can save up to 45% on water consumption when compared to conventional bleed systems, meaning lower running costs and bigger savings for you.